An 18th century wonder of architecture nestled between the villages of Fontvieille and Maussane, the Chateau d’Estoublon is a wonderful vineyard which enchants one and all. A visit to the Chateau is a must to discern what really lies inside it. 8 stained-glass windows crafted by the Demoiselles Monferini which are named as Becasse, Flamant rose, Martin-pecheur, Hibou, Guepier, Guichet, Sanglier, Renard and Raton laveur. 2 symbolic stained-glass windows in the west and east walls depicting a white deer with a burning crucifix in its antlers. Extra virgin olive oils from the chateau’s own gardens. A lovely vineyard that produces fine wines each year. A grocery store that holds Chateau’s own production of yams, jams, creams and other products. A shop offering various clothing and accessories. You can even get married at the grand Chateau d’Estoublon. The Bistrot Mogador is open for brunch on Sundays and Statutory holidays. In March the Bistrot is open till only Lunch. From April till June, the Bistrot is open from Tuesday till Sunday for lunch, and open for dinner on Friday and Saturday. How popular is Chateau D'estoublon? 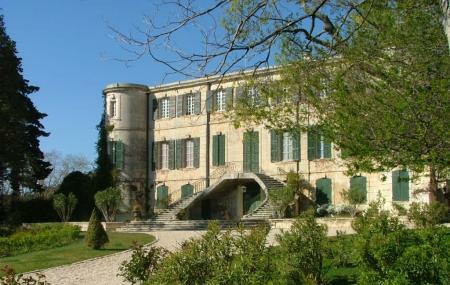 People normally club together Abbey Of Montmajour and Pure Lavande while planning their visit to Chateau D'estoublon.